Are you looking for modest wedding dresses that are "stylish and appropriate" for your circumstances? Maybe you are a mature bride looking for a wedding gown that provides "more coverage." Or perhaps because of religious reasons you need a modest wedding gown. Whatever your reasons may be... you are going to discover that a modest bridal dress doesn't have to be simple and lack style. "Modest dresses can be elegant and beautiful while providing more coverage." Another possibility is to have a custom made wedding gown designed the way you desire. Find a wedding dress maker to do this for you or if you have pretty good sewing skills you can make your own wedding dress. Did you know you can go to a dressmaker shop and ask the sewing professional if she can add cap sleeves or puff sleeves for you? They can tell you if this can be done for your wedding dress style. Another detail you can add to your gown is to buy or have a shrug, jacket or wrap made to go with your gown. This can be worn during the ceremony and then removed if you wish during the reception, for versatility and comfort. Some manufacturers and designers, such as Davids Bridal, have cap sleeves that can be added to strapless wedding dresses. Even if you didn't buy your gown at David's you can still possibly use their sleeves. Just make sure the fabric and design of the cap sleeves will work with your gown. Some religions have requirements that make it necessary to find a modest wedding dress. That usually means you are required to wear sleeves as well as higher necklines. If this is what you need, I can get you started. For more information on where to find LDS wedding dresses or temple wedding dresses take a look at this list. Modest wedding dresses have beautifully designed details such as the pick up skirts, ruching, color sashes and fit and flare silhouettes. Just because it's modest doesn't mean it has to lack style! Check out this gallery of wedding dresses with sleeves, long and short! 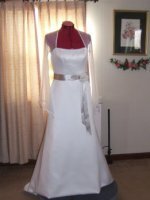 "I am sure the above links will help you in finding a modest wedding gown that will become your perfect wedding dress!" A list of wedding dress designers who design modest wedding gowns. Check out this list of wedding dress designers who create modest bridal dresses..
Take a look at these gorgeous long-sleeved wedding dresses. Who knew long sleeves could look so elegant on a wedding gown?